APSF has produced a 7-minute long Executive Summary video of the APSF-sponsored conference, Opioid-Induced Ventilatory Impairment (OIVI): Time for a change in the Monitoring Strategy for Postoperative PCA Patients, held in Phoenix, AZ on June 08, 2011. The intended audience is everyone who cares for patients receiving opioids in the postoperative period. To download video, right click on DOWNLOAD link above and select “save target as” and then save the file to your computer. To download video, right click on DOWNLOAD link above and select “Download Linked File as” when using Safari (“save link as” when using Firefox) and then save the file to your computer. 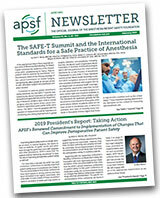 APSF believes that clinically significant drug-induced respiratory depression (oxygenation and/or ventilation) in the postoperative period remains a serious patient safety risk that continues to be associated with significant morbidity and mortality since it was first addressed by APSF in 2006. With this background, APSF sponsored its second one-day conference on this topic bringing together 136 stakeholders from diverse backgrounds (physicians, nurses, industry representatives, family representatives, pharmacists, hospital administrators, insurers, regulators) to address the following question, Essential Monitoring Strategies to Detect Clinically Significant Drug-Induced Respiratory Depression: Why and How? All patients should have oxygenation monitored by continuous pulse oximetry. Capnography or other monitoring modalities that measure the adequacy of ventilation and airflow is indicated when supplemental oxygen is needed to maintain acceptable oxygen saturations. Monitoring continuous oxygenation and ventilation from a central location (telemetry or comparable technologies) is desirable. This information needs to be reliably transmitted to the healthcare professional caring for the patient at the bedside. Structured assessment of the level of sedation/consciousness is a critical component of the nurse’s routine postoperative patient assessment for detecting respiratory depression.